They day started out inauspiciously, with yogurt and honey and then lunch eaten quickly from the catered lunch at work. But then dinner happened! 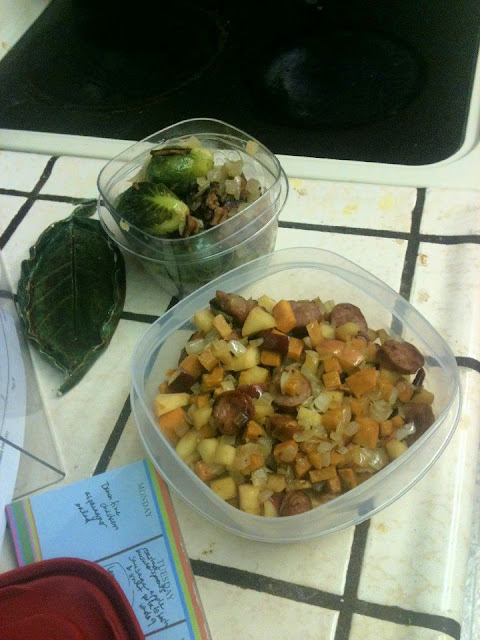 Dinner was a sweet potato, apple, and sausage hash and brussels sprouts with bacon. A little pork heavy, but delicious! I once again forgot to take pictures until after dinner, when I was packing leftovers for my lunch tomorrow. Trust me, it was awesome. Both recipes are from the packet of nutrition information that I got at my Crossfit intro class, so they are paleo-approved. And they are also CJ and Blondeez approved! Heat cooking fat in a large skillet. Add diced sweet potato and cook for about 10 minutes, until you can just pierce them with a fork. Add apple, onion, and pepper and cook until tender. Meanwhile, brown sausage in a separate pan, then chop and add to vegetable mixture. Serve hot. Heat a skillet over medium heat and cook the bacon until crispy. Pat the cooked bacon dry and cut or crumble into small pieces. Cook the chopped onion in the rendered bacon fat for about 2 minutes, until they soften. Add the whole sprouts, stir well, and cook about 3 minutes, until they start to soften. Add the chicken stock, bring to a boil, and then reduce to a simmer and cover for about 10 minutes. When cooked, drain remaining liquid and sprinkle with crumbled bacon. After dinner CJ and the kid cuddled while I put together marinade for chicken drumsticks tomorrow! Yum.